Carved on wood and stone and traced across the sky, Buddhism has a long tradition of expressing the tranquility, challenges, and beauty of spiritual life in writing and art. 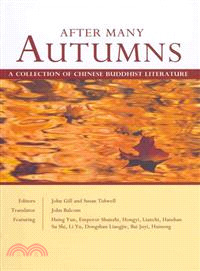 After Many Autumns collects over two hundred of the most well-known and beloved works of Chinese Buddhist literature in a single volume. In poetry and prose, After Many Autumns culls from centuries of celebrated composition from monastics, hermits, sages, and scholars as they communicate subtle truths. Fluidly translated and annotated, and complete with biographical and historical notes, After Many Autumns is a one-of-a-kind collection for lovers of impactful writing and spiritual wisdom.Authors featured include Bai Juyi, Baizhang Huaihai, Cihang, Dongshan Liangjie, Du Fu, Fu Dashi, Hanshan, Hongyi, Hsing Yun, Huangbo Xiyun, Huineng, Lianchi Zhuhong, Li Yu, Meng Haoran, Ouyang Xiu, Pei Xiu, Sengcan, Shide, Shiyuan, Emperor Shunzhi, Sima Guang, Su Dongpo, Taixu, Tao Yuanming, Wang Anshi, Wuzu Fayan, Xuyun, Yinguang, Yongjia Xuanjue, Yongming Yanshou, Emperor Yongzheng, Zhang Daqian, Zhaozhou Congshen, Zhu Xi, and many others.